MICHAEL RICHARDSON is one of a small band of “HARD-CORE” plein-air painters who work out of doors in all weathers and often endure considerable discomfort in order to achieve their desired image. Whether perched on a cliff-top in Cornwall, sitting on wet flagstones in St Marks Square, or standing knee deep in a snowdrift it is the close contact with his chosen subject that he finds so exciting and it is often the fleeting light effect which he strives to capture in his work. There is no place for the camera or the warmth and comfort of the studio in this type of work. It will not benefit from glazing or “tidying up” but will often show the scars of the battle with the elements, blown sand, grass seeds and rain drops all of which can affect the surface of these paintings not to mention the tugging of wind at the sleeve! Michael studied Sculpture and Painting in Ipswich and Paris before antering the Marine Industry as a designer. 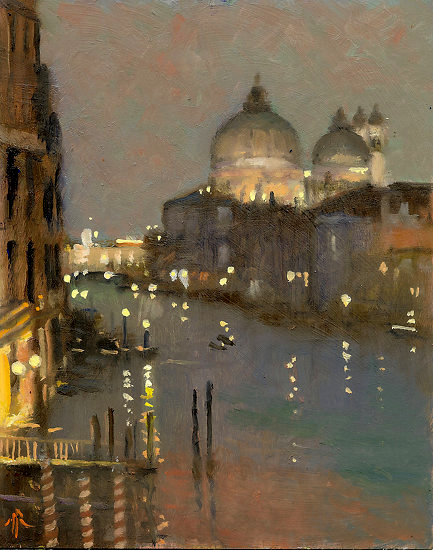 Since painting became his main focus in life he has produced several one man shows and is a member of the Prestigious Plein Air Society THE WAPPING GROUP OF ARTISTS which has exhibited in many city and provincial galleries and the Annual Exhibition takes place at the MALL GALLERY in London. He is also the founder of a small group of winter painters known as the “BRASS MONKEYS ART SOCIETY”. His work has also been shown at the ROYAL ACADEMY SUMMER EXHIBITION most recently in 2010. He was recently selected as a finalist for the BATH PRIZE and was an award winner in LONDON LIVES at the BANK SIDE Gallery and the ART IN THE OPEN COMPETITION in Wexford Ireland. He is represented in the West End by the ENID LAWSON gallery. His work has also been exhibited at the MALL GALLERY with the RSMA , RI and RBA and he is a member of the CHELSEA ART SOCIETY. He has been a regular exhibitor at the FRANCES ILES Gallery, LINCOLN JOYCE Gallery GRAHAM AND OLDHAM Gallery, NEVILLE Gallery and PICTURECRAFT at HOLT and many others. Well travelled, he carries his paints every where and as a result his work has found enthusiastic homes all over the world.